We are delighted to bring the concept of shared ownership to the Lutsen-Tofte area with our exclusive offering of Surfside on Lake Superior townhomes sold in quarter shares, half shares, and whole ownership. Shared ownership combines the comforts of a luxury vacation on the North Shore, with the rewards and benefits of owning a second home. You can live the dream of owning a lakeside vacation home at a fraction of the price. And, the best part, its hassle free. As if that weren’t enough, when you own at Surfside on Lake Superior, you’ll have full access to resort services and amenities including the indoor pool, sauna, hot tub, fitness center, tennis court, and our signature Waves of Superior Spa. What is fractional ownership and how does it work at Surfside? Fractional ownership has been around for decades with its roots in Europe. At Surfside, a quarter-share of each unit is sold to four separate owners. The owners may be related or unrelated and owners can purchase multiple shares. Each owner receives a deed and has a separate parcel ID number. Each owner is assigned 13 weeks of ownership per year and is entitled to all the resort services and amenities. During those 13 weeks, an owner can decide to come up and stay in the unit, or put their unit in the rental pool to generate income. A pre-determined, rotating calendar is in place to determine ownership weeks. Essentially, each owner receives every fourth week of ownership. Because of holidays, and to keep it fair, the calendar rotates each year. Therefore, Owner A doesn’t always get the 4th of July. In a period of four years, each owner will have access to every major holiday. There are no restrictions about exchanging days or weeks with the other owners, though of course it must be mutually agreed upon. What advantages are there to fractional ownership versus whole ownership? Fractional ownership offers many advantages and benefits to the owner. All expenses normally associated with ownership (such as insurance, real estate taxes, association dues, telephone, utilities, cable TV, maintenance, and replacement costs) are split between the owners of all four shares. When I buy at Surfside do I actually own lake shore? When you purchase a Surfside townhome you automatically become a member of the Surfside on Superior Homeowners Association. The association owns all of the common areas, including the shoreline. This provides you with unlimited access to over 780′ of gorgeous ledge-rock shoreline. 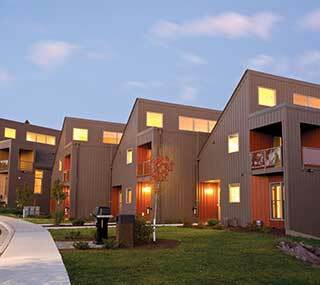 What amenities and furnishings come with ownership at Surfside on Lake Superior? Through ownership of your fractional unit at Surfside on Lake Superior, you have access to all onsite amenities including an indoor swimming pool, whirlpool, sauna, fitness center, spa, tennis court and acres of accessible ledge-rock shoreline. All furniture, accessories, kitchenware, electronics, linens, décor, and appliances are included in the purchase price. 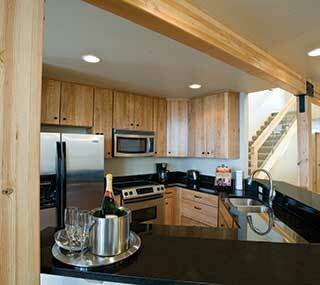 All townhomes are professionally decorated with distinctive coastal contemporary furnishings. Will you offer the opportunity to rent my townhouse in my absence? Yes. Association rules and regulations require that owners who choose to rent their unit for nightly rental use the services of a professional management company. Tofte Management Company (TMC) is one of the options. TMC has a proven track record with more than 30 years of experience successfully managing Bluefin Bay on Lake Superior as a high-end resort. TMC prides itself on seamlessly providing the highest quality services, ensuring that your vacation and owning experience is an enjoyable one. The management company cleans the property for all owners and guests so that everyone who arrives is guaranteed a clean unit. The owners are charged for cleaning only when they stay at the property. Quarter-shares typically gross $24,000 in annual rental income, helping to offset the costs of owning. How much are association dues and what are they used for? Surfside owners become members of two Owners Associations at Surfside: 1) The Surfside Homeowners Association; and 2) The Surfside Shared Interest Association. The Homeowners Association pays all shared expenses for services and maintenance related to the property, except the interiors of individual units. These expenses include snow removal, lawn care, building insurance, common area maintenance, landscaping, pool, hot tub, sauna, and a replacement fund for long term upgrades to these facilities. The current Homeowners Association dues for whole unit ownership are about $900 per month. That means that a quarter share fractional owner would pay about $250 per month. The Surfside Shared Interest Association pays all costs involved in keeping up the interiors of the units, including heat, lights, telephone, interior maintenance, repairs, insurance for interior contents, a quarter share management fee and contributions to a furniture replacement reserve fund. Each quarter share owner pays dues budgeted to cover one fourth of the expenses for services and maintenance of the interiors of their own unit. Shared Interest Association costs will vary based on the actual expenses incurred by each individual unit and currently average $360 per quarter share per month. What happens when it comes time to change the carpeting and furniture of my townhome? As a part of your association dues, there is a replacement budget established and funded to adequately redecorate and acquire new furnishings. The association employs the services of an interior designer who makes recommendations to the board of the Surfside Shared Interest Association. The board of directors makes the ultimate decision on furnishings for all units. This process will ensure that we maintain high quality and consistency in all townhome décor. Real estate taxes are levied based on the Estimate Market Value (EMV) of each quarter share interest. In 2016, the annual taxes per quarter-share are $1,458. Is there storage available for my personal effects when I’m not there? Yes. We provide secured storage space for each owner’s personal belongings. Storage areas are located in the basement and on the main floor in the pantry near the kitchen. Surfside allows pets in a number of units throughout the resort. All owners of a pet-friendly unit must agree on the unit’s pet policy. Please keep your pet preference in mind when choosing a unit in which to purchase. A pet exercise area is provided.